It has been a really interesting week, our Asus Eees have been on site for a while, but actually getting them into the hands of the students has proven a challenge. Taking the bull by the horns I wondered how the process might work, if I got them charged up and worked with the students to set up the devices from scratch. We have done a lot of work across a range of software environments, but not with an operating system before. The process proved to be not so challenging as I first thought, taking the process step by step, working in pairs and using peer review as part of the activity, we have managed to get 20 machines setup from first boot, installed a wireless connection to allow students to access the guest network, and set firefox preferences so that the browser's home page is that of the school web site, the home page for our emergent learning platform. After a nervy start I was impressed with how quickly the students managed to achieve our goals. For an adult in the know, it can take around 10-15 minutes per machine, possibly a little less once in the flow, and with sets of machines powered up. It took a little longer around half an hour, because of the stop start process involved, supporting the process with a projected monitor on the IWB, and ensuring we were all keeping together and to task, but the students were really pleased with themselves and quite rightly so. When they were finally able to access the web and open some familiar tools. Normal first boot process for a PC involved setting up the keyboard, choosing a language, and a time zone. Followed by setting a password for the machine, and un hatching a radio button to allow bypass of this when the machine is turned on. Setting up a wireless connection using the wizard, this was largely a skip through process but because our wireless connection is hidden, required input of an SSID, and giving our network a friendly name. 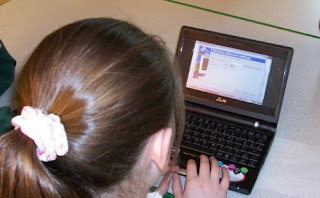 Logging onto the school's guest Proxy, before being able to access the web and setting the browser's home page preferences. Of all the machines set up, only 2 would not accesss the web when we had finished, and both of these were down to cursor slip when the students were selecting network types in the set up wizard. The touchpads seems really sensitive on these versions of the machine. In terms of managing the process of set up correcting two slipups, beats the time scale to set up 20 machines from scratch. I have another 10 on charge this evening, to complete 2 class sets tomorrow during assembly. Planning to go through the process again next week knowing the pitfalls with 2 year 5 classes, hopefully having some of my Y4s as technical support will help. As for the Y4s who will be using their class sets next week for the first time, we have a webquest in store. The VLE currently hosts a collection of short texts and image galleries about India. We have added some useful web sites, and uploaded a powerpoint template with key areas to investigate. In literacy we will be looking at notetaking, and using three simple slide styles to present our research. 1) Simplifying a short web based text for a slide aimed at a younger audience. 3) Picking out key ideas from a text and presenting these as images from a web search. Building around these ideas the students will be encouraged to choose from each to develop their own digital slideshows as part of a Passport to India Challenge. 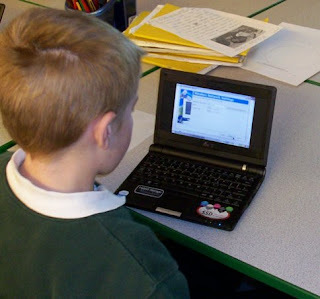 The value of the tools being placed on the VLE is that some children may choose to carry on their work at home, giving the opportunity to introduce the file box tools on their home pages as a way of moving work between home and school. This morning J arrived with his flash drive and a copy of the completed Vishnu tale he had been working on, he certainly may benefit from introduction to this device as a means of sharing his work with both myself and friends. Working in the smaller group setting, where the tool is embedded in the overall activity, and with access to the tools by all throughout the challenge process it will be interesting to see how the students use and adapt the space throughout the week, and engage with each other within the environment. Next week will certainly be one for the Digital Camera, and with material uploaded for sharing hopefully a starting point for a spot of review and reflective writing over Easter.